When President Barack Obama spoke of the attack against a kosher supermarket in Paris, he chose the path of evil. If he misspoke by accident, he and his spinners have had ample opportunity to come clean and explain that sometimes you just hear yourself rambling and lose it. Well, Obama lost it…as he is losing it more and more often as the months go by. Opportunity after opportunity has been lost and whatever diplomatic abilities he once had are being eroded by the ego that never sleeps. What he did, was choose to inflict more hurt, more anger. He chose to adhere to his agenda to downplay the absolute barbaric nature of Islamic extremism by trying to take something from the victims…and what he tried to take is unthinkable. A Jew is commanded to forsake all but three of our many commandments to save a life – their own, someone else, it really doesn’t matter. One of those three things we don’t let go is the essence of what and who we are. 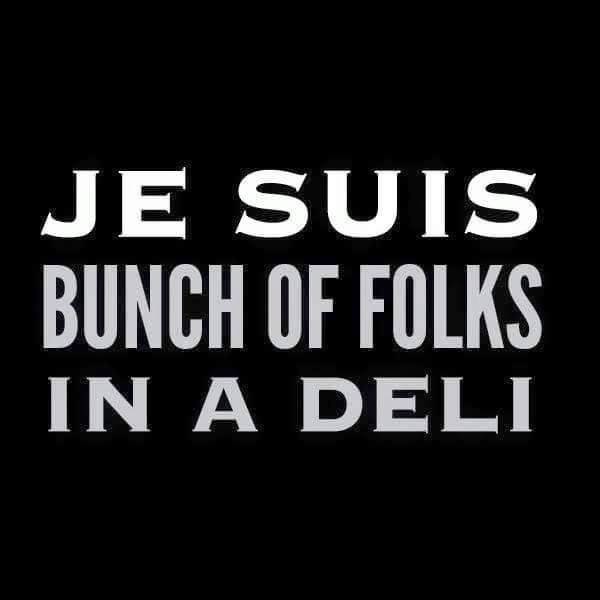 A “bunch of folks” weren’t murdered in that deli and it sure as heck wasn’t random. I have, until now, avoided the Je Suis business. Mostly, because often when you paint something with a wide paintbrush, you pick up more than you intended and in claiming what you are, you may end up saying something else. For the first time, this one, I will claim. They were my people in that deli. Those four Jewish men didn’t “happen” to be there. They were Jewish men shopping in a Jewish store hours before the Jewish Sabbath and the terrorist didn’t happen to be there either. He picked the store, picked the time and if he didn’t know the names of the victims (how low does the White House have to go to get to that excuse to explain Obama’s absurd use of the word “random”), the killer knew the essence of what they were. It is impossible, after 6 long years of the reign of Obama to ignore his absolute disdain for our Prime Minister, our country, our religion. So filled with himself, Obama’s latest insult means little, even if it is one of his most demeaning ones. The way I figure it, a pile of manure will smell horrendous. At some point, it no longer makes a difference how high the pile is, how long it stays in the same place. This latest insult of Obama…it’s just piling more on the mountain. Once you recognize the mountain for what it is, the man for who he is, it’s pretty much a done deal – the man can’t stand Israel, and like his preacher, is going to do all he can to hide his anti-Jewish feelings by clouding them with other random attacks on random targets…all of which happen to be Israeli and Jewish. I heard Obama’s comment and the anger washed through me – I expected no less, honestly. But what is chilling is the lengths others will go to defend, to explain, to spin. Why, for once, can’t Jen Psaki just be honest and say she doesn’t know why Obama would suggest that the attack was random? Just once, I’d love to see her stare at the reporter and say, “well, I just can’t explain this one.” Why does she intentionally attempt to twist this into an issue for the French, who certainly never suggested this was a random attack? As she stutters and stumbles, this normally free speaking woman shows clearly that she’s at her wits end because, really, only someone who is witless could justify Obama’s stupid remarks. And then there’s Josh Earnest – looking not very earnest at all. You see, says Mr. Earnest, it was a random attack because apparently the terrorist didn’t know the names of the victims and didn’t seek to kill a specific person. The fact that the terrorist went into a Jewish-owned store on a Friday afternoon to kill Jews doesn’t make it a specific attack on Jews unless the killer knows their names? What we have here are more examples seemingly intelligent people choosing the path towards idiocy. But then again, having to explain Obama to the world would probably turn even the most educated person into a blooming moron.